I find it somewhat amusing that people, devout members of either political party here in the U.S., attribute the success or failure of the stock market to the President. They're obviously misinformed. They have fallen for the partisan propaganda machine that each party can wield at any time whenever suitable. The media fans the flame of this misconception to get ratings, clicks, subscriptions, and so on. During the State of the Union Address, President Trump made a typical Presidential error. I say "typical" because I'm pretty sure President Obama did it too. Trump took to congratulating himself and the Republican party for the added rise in the stock market since his 1st day in office. It's a vote getting move, and you use what you have at your disposal to sway feeble minds. If the market keeps progressively declining all the way to November, when the next elections take place, the Republican party will be hush on the stock market. That's a guarantee. Democrats will be loud, blaming the Republicans for the market drop. Again, it's politics. The people buy it. They take to Twitter and Facebook, and everywhere else to talk the state of the stock market as it relates to politics. If you're a Trump supporter, you defended the 1,100 plus point DOW point bloodshed today, no doubt using stupid arguments like: "It's still well above where Obama had it!" Or, "It's an up and down market and it will come back!" If you're anti-Trump, you had a great day, imagining Trump having to eat his words. The fact is, Presidents have no control over stocks, bonds, and the markets. But don't just take my word for it. Let's examine the Obama presidency and compare it to the fledgling Trump presidency. Republicans and conservatives hated the Obama presidency (Jan 20, 2009- Jan 20, 2017), taking every possible opportunity to critique him. Similar to what the liberals and Democrats are doing with Trump today, right? Obama was said to be "anti-business." He spearheaded Dodd-Frank, and signed it into law on July 21, 2010, regulating the banking industry. This should've been bearish for stocks, especially the financials. What about corporate taxes? During both of Obama's terms, the corporate tax rate was a whopping 35%! One of the highest in the world. Companies had to to send their free cash abroad to keep it from such heavy taxation. Certainly this anti-business, anti-Republican (trickle down) policy should have been bearish for stocks. I can recall good ol' Larry Kudlow on CNBC tearing Obama a new one almost every evening for his anti-stock market stance. But what truly happened? Was Obama's seemingly "socialist" position enough to derail the bull market? No! Under Obama, the stock market had a cumulative return of 233% and an annualized return of 16%. Only President Clinton bested him. But I'm not here to laud the work of Obama. On the contrary, I'm here to say that one cannot attribute the rise OR fall of a market to what Presidents do. Obama was Johnny On The Spot, inheriting from his predecessor one of the worst market conditions since the Great Depression. And he reaped the benefits of what inevitably happens after a major stock market decline, a stock market rally! There is no debating Trump's 2017 Jobs Act and the Republican tax cut plan that lowered the corporate tax rate to 21% is pro-business. It should be bullish for stocks. In fact, the prospect of Trump becoming President and then the actual event of it was enough to produce a bullish signal. Dubbed the "Trump-trade," many investors made money when Trump took office. The Trump-trade is no more. Old as Trump himself. Companies are flush with cash. Mad Money host, Jim Kramer, believes that things are not the same as they were immediately following the crash that gave birth to the Great Recession. No...things are way better! And he's not wrong about that. Companies are repatriating their cash and not having to pay insane amounts of taxes doing it. The economy, for all intents and purposes, is great! Low unemployment. Wages are starting to rise in some places. Inflation is under control. So what gives? Why has the stock market tanked the past couple of days? Trump supporters take note. Your President inherited a bull market that may be on its last legs, meaning Trump is late to the party. Through no fault of his own, he was elected at a time when the stock market was on year 7 of gains. 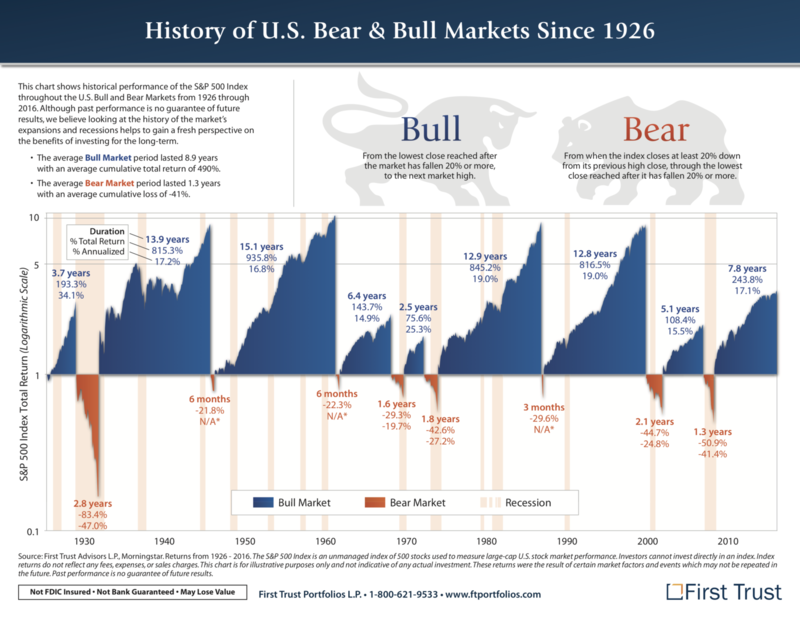 Since 1926, the average bull market has been 9 years! The Trump presidency still has three more years to go. Even if the market should bounce back from this week's and last week's losses, the odds are heavily stacked against Trump. Screaming "Make America Great Again" (MAGA) won't protect Trump or the Republicans from the whims of the market or its bear cycles. If a Democrat was in office today, Hillary or whoever, they too would be at the mercy of stock market factors and cycles. There are certain factors that dictate how the market performs overall over time. Economic markers are by far the greatest contributors to market performance. Things like the amount of available cash in the economy, credit opportunity, wage growth or lack there of, employment, inflation, asset price appreciation, and so on. The policy of the Fed in response to changes in the economy also dictate how the market will (or should) perform. For example, when the Fed lowered the Feds Fund Rate to spur the economy after the crash of 2007, this was a bullish signal for the stock market. And indeed, the market went on an epic tear. The money went from safety (Bonds) to stocks in droves. Nobody wanted a 10-year T-bill that was offering less than a 2% yield back then! Of course you can also count on the fact that after each bear there will be a bull, and after each bull, there will be a bear. So pay attention to the (roller coaster) ride! Nobody knows when a bull market will come to an end, or vice versa, when one will begin. Nobody knows when a bear market will come to an end, or when one will begin. Trump may be the greatest President whoever lived to some of you, but even he is no match for Mr. Market. If you don't invest in the stock market, do yourself a favor and leave talk of the stock market out of your everyday conversation, especially if you are listening to talk radio or your favorite news channel. Know that no President can help you make money in stocks. It all falls on what you know, what you don't know, and what nobody knows. *If it seems to you liked I bashed on either Obama or Trump, you didn't get it. Please re-read. What to Do with Extra Disposable Income?